Just a couple of years ago, you couldn't get past page one of a large business newspaper or website without seeing some "expert" making prognostications of the imminent death of the laptop. Well, it's now almost 2015, and we're happy to rub reality in their faces, and remind the naysayers that they were wrong. Dead wrong. The familiar clamshell that's been with us since the 1980s isn't going away anytime soon, and it's difficult to see it ever going away, frankly. So let's get on with the best laptops of 2014. Agree? Disagree? Why no Macs? Let us know. 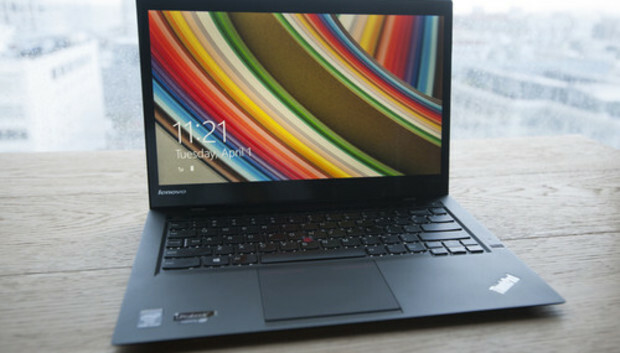 Lenovo's ThinkPad line has a legendary reputation, and the ThinkPad X1 Carbon lives up to it. With the slim figure of an Ultrabook (it's even thinner than its predecessor), you get a carbon fiber lid and magnesium alloy body. The screen is much improved over the original version, and it supports touch control (you know you use it). The keyboard is quite good for an Ultrabook keyboard, and our only serious kvetch is that Lenovo left out the caps lock key. Perhaps the engineers wanted to cut down on people SCREAMING ON THE INTERNET. Its hard not to be impressed by the Alienware 17. A lot of large gaming laptops tend to look generic, but you know this honking-big beast is an Alienware the second you lay eyes on it. There are, of course, those sweet Alienware lighting effects, which let you customize just about every LED on the unit. Inside the Alienware 17, you'll find reinforced WASD keys, a GeForce GTX 880M with a ginourmous 8GB of RAM, and an Intel quad-core Core i7 chip too. Heft up the Alienware 17, and you'll immediately know you're toting a gaming laptop that's actually built to be carried. There's no flex or popping of plastic panels that we've experienced on other gaming laptops. Sometimes you have to bring work home with you. When that happens, you might as well bring the whole damn workstation. Fortunately, that's easy with the HP Zbook 15, a workstation-class laptop with no-nonsense silicon, like a quad-core Intel Core i7-4800MQ chips and an Nvidia Quadro K610M GPU. The Zbook 15 was one of the first PC laptops to sport a Thunderbolt connector. Some may feel Thunderbolt is heading for the dustbin, but for those who do need it on a PC laptop, this is one of the few with that has it. Add in respectable battery life for such a beefy notebook, and you have a heavy-duty, working person's portable. It would be easy to overlook the Toshiba Kirabook this year, as there's been such great competition in the ultra-portable laptop space. But look past this beauty at your own risk. The Kirabook offers a Retinastical 2560x1440 resolution across its 13.3-inch screen, and the chassis is imbued from top to bottom with a sleek, luxury feel. Combine the beautiful industrial design with solid battery life and performance, and you have the sleeper laptop of 2014 for, well, those who want to think differently. The Samsung ATIV Book 9 gets our collective nod of approval--but with stipulations attached. It's not the fastest, nor the thinnest. Nor does it pack the highest resolution screen. So why even mention the ATIV Book 9? Because it's got a great audio subsystem. Laptops generally have pretty atrocious audio. And I don't mean the speakers smaller than dimes, as that's a problem that can't be overcome when you don't have space. But pack audio circuits into something so small with the cheapest 50-cent audio CODEC, and you get the very definition of mediocre audio. That's not so on the ATIV Book 9. The company paid special attention to quality by adding a Wolfson WM5102 inside. And it paid off, causing reviewer and audio enthusiast Michael Brown to declare "[the ATIV Book 9] is by far the best-sounding laptop I've ever listened to." And no, please don't buy this notebook and then plug in your USB headset and declare you can't tell the difference, because you just bypassed the internal CODEC. Is it a laptop, a hybrid, or a convertible? Whatever it is, it's thin. In fact, Lenovo says it's the thinnest notebook around. But what's especially cool is the Core M processor, which uses Intel's new Broadwell architecture. The machine isn't universally faster than, say, Microsoft's Surface Pro 3, but when you consider that the Yoga 3 Pro nearly matches that Surface (or is slightly faster) in some tasks while using about a third of the power, that's a win. It also doesn't hurt that the Yoga 3 Pro features a gorgeous 3800x1200 IPS touch panel that can be folded completely flat or flipped all the way around, striking as many poses as a voguing nightclub dancer. It's been said that it takes Microsoft at least three iterations to get things right. That saying holds true with the Surface Pro 3, which finally got it right. Sure, it's not everyone's cup of tea but many who have given the Surface Pro 3 a legitimate chance to win them over have been won over. It doesn't hurt that Microsoft sweetens the offer with an n-trig pen, a highly rated 2160x1440 panel and tablet-like weight, either. Will Microsoft continue its Surface initiative? No one really knows, but even if it does abandon Surface as it pivots again, we can at least credit the company for kickstarting the latest wave of hybrid laptops.